It is rather strange to be reading this book in Russia. We in the west have grown up on heroic tales of World War II derring-do (of which this book is one), but here in Russia they have a different view of how the war was won. For them, the hard slog of repelling the Germans at Stalingrad was the decisive moment, not D-Day. It was in Russia that Hitler suffered his first defeat. 27 million of their countrymen died in World War II, and (from what we’ve been told) Russians feel that western historians such as Antony Beevor tend to focus on poor German strategy and the bitter Russian winter as the causes of Hitler’s defeat, without acknowledging the incredible courage of Russian soldiers and civilians in the battle to force the German retreat from the USSR. I didn’t finish reading Beevor’s Stalingrad before we left home, so I don’t know if this impression is a fair one, or not. I’m merely reporting what we’ve seen and heard here. However from what I read of it, I think that Beevor does acknowledge that Stalingrad was won at least in part through sheer determination, fighting street-by-street with very limited resources while besieged on all sides. It may be a matter of degree. But Vasily Grossman’s account of this heroic battle in Life and Fate depicts the human face of it in a way that no non-fiction history could ever hope to do. That was what brought me nearly to tears when we visited the War Memorial at St Petersburg. 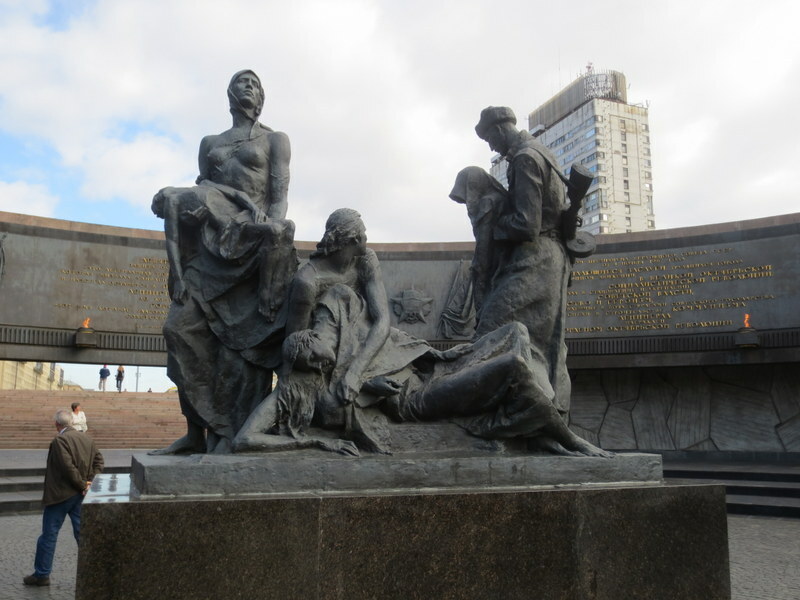 The St Petersburg Memorial is on the outskirts of the city (then called Leningrad) and it shows just how close the Nazis came. Here as at Stalingrad they encircled the city and they besieged it for 900 days. No food or supplied could get in by land or sea, and the Nazis had control of the skies so there could be no food drops either. Hitler’s expressed intention was (contrary to his view of protecting Paris) that he wanted to obliterate the city, and the bombardment was intense. (You can see photos of how they trashed Pushkin, a satellite town southwest of St Petersburg when you visit Catherine’s Palace. You can also see the memorial to the Jews who were despatched to their deaths from there). Throughout our tour our guide told us incredible stories about how, as the Germans advanced, the golden turrets of the St Petersburg cathedrals were camouflaged to conceal where the centre of the city was, and how the treasures of the museums were spirited away to safety in eastern Russia or stashed in cellars and basements. But the statuary here shows the impact on ordinary civilians, how many of them died of starvation once the siege began and there was no way in or out of the city. The sheer scale of casualties impacts still on every St Petersburg family. 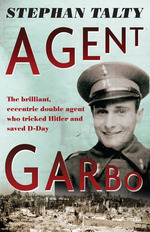 Stephan Talty’s book, Agent Garbo: The Brilliant, Eccentric Double Agent Who Tricked Hitler and Saved D-Day, however, is about a different kind of war altogether, the world of spies and secret intelligence services. And it is a most amazing story. Juan Pujol was a Spanish nobody, a disappointment to his father and a failed businessman when World War II fascism loomed. He had already seen the effects of Franco’s fascism, and he dreamed of fighting against its spread elsewhere. To read the story of how this inconsequential man convinced both the Germans and the British of his usefulness as an agent is extraordinary. To some extent, Talty contrasts the ‘style’ of the rival spy agencies in a way that we have come to recognise from war stories in film and on TV. His thesis is that the British eventually accepted Pujol because they had a preference for clever eccentrics in their intelligence service, compared to bumbling Nazis landing non-English speaking agents in Britain where they were promptly recognised by local farmers. Although he acknowledges that there were exceptions, Talty describes the German High Command as hidebound by a ‘culture of medieval mysticism’ and a strange kind of ‘Aryan voodoo’, surrounded by ‘spiritualists, conjurors, seers and fakirs’. This kind of commentary is droll, but some of the German agents must have been considerably more efficient than this, as Anna Funder’s novel All That I Am shows. The German anti-Nazi activist Dora Fabian and fellow political emigré Mathilde Wurm were almost certainly murdered by German agents in 1935 but the case remains unproven to this day. But Talty writes while that the Germans recruited on the basis of loyalty and efficiency, the British recruited from the universities and the intelligentsia. These British eccentrics dreamed up all kinds of bizarre but cunning ideas. They didn’t always work – but they often did, sometimes out of sheer audacity. The military on both sides apparently had a distaste for secret agents, and the Brits’ disdain was exemplified by insulting code names that they had for their spies. Garbo, however, was distinguished by having the name of the glamorous film star bestowed upon him, a name which also offered Pujol additional protection because if the name were detected, it would also imply that the spy was female. Together with his British minder, Tommy Harris, Pujol/Garbo developed a network of fictional sub-agents, phony documents, and non-existent battle plans (such as the one to – literally – set the English Channel on fire). Pujol successfully fed this fake information to the Germans who trusted him so much that they believed it all. This was achieved partly by having him send true reports about impending actions, but having the report ‘delayed by censorship’ so that the Germans received the information a day late, ‘proving’ that his intelligence was reliable and that it was ‘just unfortunate’ that it had been delayed. Explaining the ins and out of the deceptions and counter-deceptions in London, Madrid and Berlin is complicated and I often found it a bit confusing. At times it all seems a bit overburdened with detail, but I think this is probably necessary in the interests of historical accuracy, and without the detail, it might otherwise seem like an improbable fantasy. The book is also a little short on biographical detail about Pujol other than his espionage activities, so there is not much sense of him as a person. This is most obvious at the end when Talty is tying up the loose ends of Pujol’s postwar life and we are left with conjecture about his personal relationships, which for me, would have been very interesting to learn about. But it seems that the life of a double-agent (especially when there were so many ex-Nazis in certain parts of the world) must remain shrouded in mystery. Rob Minshull reviewed it for ABC Queensland and so did D.B.Grady for The Atlantic (with the somewhat extravagant review title of ‘The Man Who Won Normandy’).